From the time it was conceptualized, the Philippine Genome Center (PGC) of the University of the Philippines was envisioned to extend its services beyond the borders of UP. The launch of PGC’s DNA Sequencing Core Facility (DSCF) on September 2013 paved the way to build capacity in high-throughput capillary sequencing to medium and high throughput Next Generation Sequencing (NGS). Barely a year after, the PGC launched its Core Facility for Bioinformatics on April 2014 to build capacity in processing, curating and archiving massive amounts of genomic data, and help transform complex data into useful information for biomedical scientists, biotechnologists, biologists and other scientists. 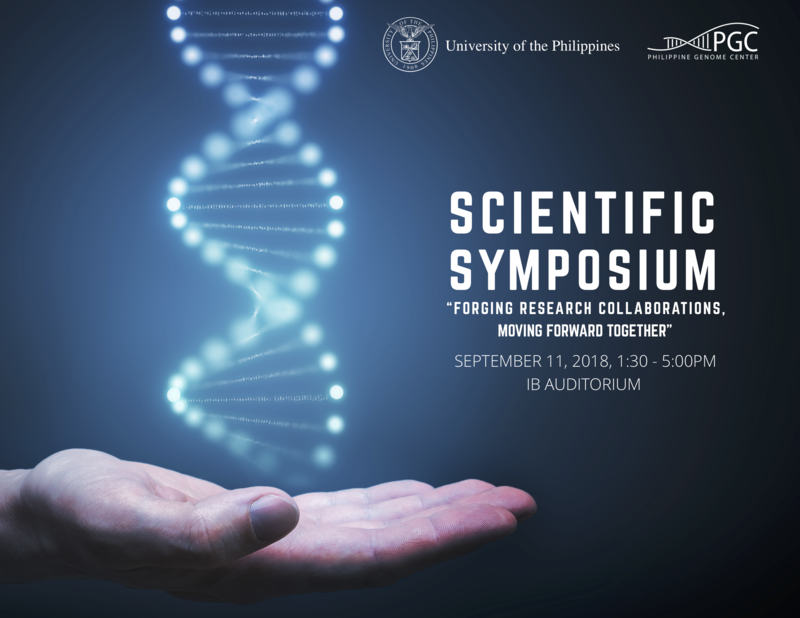 To commemorate the inauguration of its new building, with the theme “Forging research collaborations, moving forward together”, the Philippine Genome Center conducted a scientific symposium on September 11, 1pm at the Institute of Biology Auditorium in UP Diliman. The event was attended by students and faculty from various SUCs and HEIs as well as researchers from both public and private institutions. The scientific symposium opened with a brief introduction by Dr. Raul V. Destura, Program Director for Health. Followed by an overview of the genomics services and research of PGC: Dr. Benedict A. Maralit on DNA Sequencing and Bioinformatics Facility (DSBF) and Dr. Ma. Anita M. Bautista on the PCARI Shared Genomics Core Laboratory (SGCL). The symposium also featured the current status of genomics research and Bioinformatics in the Visayas and Mindanao through guest resource speakers. Dr. Anabelle Novero from UP Mindanao highlighted their DOST-funded projects on the Sago Palm which generated genomic data (genetic variation; screening and characterization of RSDA; and identification of endophytes). While Dr. Victor Emmanuel Ferriols from UP Visayas talked about Biosynthesis of highly branched isoprenoids in diatoms. In addition, Luzon-based and PGC speakers gave interesting talks such as, generating the Pangenome of Vibrio parahaemolyticus from the Shrimp Pathogenomics Program by Ms. Sarah Mae U. Penir from PCARI-SGCL. A Look at Our Hearts: Insights from the Cardiovascular Genomics Program presented by Dr. Eva Maria Cutiongco-de la Paz, PCARI-SGCL and UP Manila NIH Executive Director. A summary and an announcement of upcoming PGC events was also given by Dr. Ian Kendrich Fontanilla, Program Director for Biodiversity. Dr. Cynthia P. Saloma, PGC Executive Director closed the symposium by expressing her gratitude to participants and guests for attending the symposium.